"Lots of Cool Crafts For Kids!" You will need: cardboard paper, foil sweet wrappers, sequin stars, hole punch, gold cord and glue. Draw a star onto paper. Cut it out and use it as a template. Put the star template on top of cardboard paper and cut out a star shape. Tear the sweet wrappers into small random pieces. Glue the pieces all over the star, overlapping them until the whole shape is covered. Let it dry. Glue sequin stars onto both sides of the star. Leave to dry. Make a hole in one of the points of the star. Thread a gold cord through the hole and make a knot at the end. Take old Christmas Cards and ask the children to cut pictures out of them. Let them make a collage. Let them decorate the collage with glitter glue pens, Christmas stickers and the cut out Christmas pictures. Buy see through or one colour glass balls (red, yellow, green, etc) and let the kids decorate the glass ball, with colour gel pens, yellow stars or let them paint the glass balls. Let the kids use their imagination. Buy or make plain, thick white candles and decorate them with paint, glitter pens, and small stars. You will need: toilet roll tubes, red and green crepe paper, zig zag scissors, wrapped sweets, cracker snaps, sparkly green pip cleaners, rubber band, shiny hologram tape and glue, small red gift bows and jokes on a small piece of paper. Use zig-zag scissors to cut a piece of green crepe paper. Cut the paper long enough to gather and twist at the ends and wide enough to go around the tube with some overlap. Cut red crepe paper the same way, but a bit shorter. Put a joke, a wrapped sweet, folded paper crown and cracker snap in the toilet-roll tube. Next, put the red crepe paper under the green crepe paper, put the toilet-roll tube in the middle of the green crepe paper, with all it's "things" inside it. Wrap both layers of crepe paper around the tube, hold them in place with a rubber band. Wrap a small piece of green pip cleaners round each end of the crackers. Glue 2 stripes of hologram tape and glue them around the tubes. Remove the rubber band and decorate the middle of the tube with a red gift bow. Invite the kids to make and decorate small Christmas trees. You will need: cone shaped sugar cones, some green icing and holiday coloured sprinkles. Turn the cone upside down, have the kids cover it with green icing, then let them decorate the green "Christmas tree" with sprinkles. Bake your favourite sugar cookie recipe. Using a flat knife, spread white frosting on top of each cookie. Next, let the kids decorate the cookies with icing, sprinkles, sugar, and candies. More food fun- buy ready made or make ginger dough. Using a Christmas cookie cutter, cut Santa Clause shapes, stars etc. These is lots of fun and a big tradition in Scandinavia. You will need: 6 inch wrapped candy cane, 2 pipe cleaners, 2 wiggle eyes, brown pom pom, craft glue and ribbon. Leave the wrapping on the candy cane. 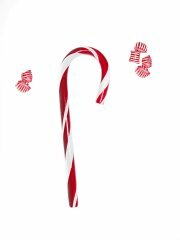 Glue the face features on the candy cane. Start by gluing the eyes- wiggle eyes and the nose- brown pom pom on the face of the candy cane. Tie a red ribbon into a bow, below the face of the reindeer. Cut one of the pipe cleaners in half. Wrap the full pipe cleaner around the crook of the candy cane- the antlers. Try to make antlers with the other cut pipe cleaners.